^ Wilhelm, Richard; Baynes, Cary F.; Carl Jung; Hellmut Wilhelm. The I Ching or Book of Changes. Bollingen Series XIX 3. Princeton, NJ: Princeton University Press (1st ed. 1950). 1967 [8 June 2010]. ISBN 0-691-09750-X. ^ Wilhelm, Richard; Baynes, Cary F. Dan Baruth, 编. Introduction to the I Ching. 5 December 2005 [8 June 2010]. ^ Lai, Whalen. The I-ching and the Formation of the Hua-yen Philosophy. Journal of Chinese Philosophy (D. Reidel Publishing). 1980, 7 (3): 245–258 [12 February 2006]. doi:10.1111/j.1540-6253.1980.tb00239.x. ^ Marshall, S.J. The Mandate of Heaven: Hidden History in the I Ching. Columbia University Press. August 2002: 50 [8 June 2010]. ISBN 978-0-231-12299-3. ^ Campbell, Joseph. The masks of God: Oriental mythology. Viking Press. 12 April 1962: 411 [8 June 2010]. ^ Needham, J. Science and Civilisation in China: Volume 2, History of Scientific Thought. Cambridge University Press. 1991: 307. ISBN 978-0-521-05800-1. ^ Abraham, Ralph H. Chapter 1. 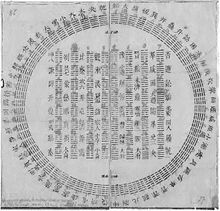 Legendary History of the I Ching. 1999 [15 February 2008]. ^ Wai-ming Ng. The I ching in Tokugawa thought and culture. University of Hawaii Press. 2000: 6–7 [6 June 2010]. ISBN 978-0-8248-2242-2. ^ Yamamoto Tsunetomo; William Scott Wilson (trans.). Hagakure: the book of the samurai. Kodansha International. 21 November 2002: 144 [6 June 2010]. ISBN 978-4-7700-2916-4. ^ Nylan, Michael. The Five "Confucian" Classics. Yale University Press. 2001: 204–206 [8 June 2010]. ISBN 978-0-300-08185-5. ^ Douglas Adams. The Long Dark Tea-Time of the Soul. Simon and Schuster. 1991: 97 [8 June 2010]. ISBN 978-0-671-74251-5. It was much like an ordinary pocket calculator, except that the LCD screen was a little larger than usual in order to accommodate the abridged judgments of King Wen on each of the sixty-four hexagrams, and also the commentaries of his son, the Duke of Chou, on each of the lines of each hexagram. These were unusual text to see marching across the display of a pocket calculator, particularly as they had been translated from the Chinese via the Japanese and seemed to have enjoyed many adventures on the way. ^ I.G. Bearden. Bohr family crest. Niels Bohr Institute (University of Copenhagen). 17 May 2010 [7 June 2010]. ^ Buckingham, Will. The uncertainty machine. Aeon Magazine. [17 August 2014]. ^ Cannella, Cara. Celebrating the Ancient Wisdom of the I-Ching at Beijing’s Water Cube. Biographile. [17 August 2014]. ^ Consulting I Ching Smoking Pot Listening To The Fugs Sing Blake (Broadside Poem). Abebooks. [17 August 2014]. ^ Studio Pressure – Form & Function Vol. 2. Discogs. [19 August 2014]. ^ Smith, Richard J. The "I Ching": A Biography. Princeton University Press. 2012: 200 [17 August 2014]. ISBN 1400841623. ^ Saad, Ezechiel. Yi King, mythe et histoire. Paris: Sophora. 1989. ISBN 2-907927-00-0. "Between past and present" Shanghai Star 2004-10-09. Accessed: 2006-01-10. This page is based on the Wikipedia article 易经的影响; it is used under the Creative Commons Attribution-ShareAlike 3.0 Unported License (CC-BY-SA). You may redistribute it, verbatim or modified, providing that you comply with the terms of the CC-BY-SA.